Zaro Family Bakery is a fourth generation family business founded in the U.S. by Joseph Zaro in 1927. He brought from Poland his Eastern European recipes such as their nationally recognized brand of challah, babka, black & white cookies, cakes, bread and rugelach. Zaro’s is now managed by Joseph’s great-grandsons who not only operate the stores but also a 40,000 sq ft bakery in the Bronx where products are produced fresh and shipped to the stores several times each day. 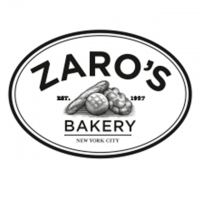 Today Zaro operates 10 stores in Grand Central Station, Penn Station, Fulton Center, Newark Union Station, and 37th St. Zaro’s also has expanded putting their brand into supermarket bakeries and food-service bringing availability to shoppers from Boston to Ohio to Virginia.